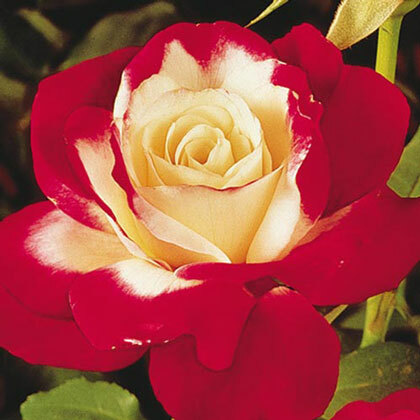 Double Delight Hybrid Tea Rose | Gurney's Seed & Nursery Co.
An outstanding bicolor, combining creamy white with strawberry red. Petals have a fruity fragrance. Grows 3-4 ft. tall. AARSchoice. No. 1 to 1 1/2 grade. Zones4 - 10 (-20° F.). Flower Form12 - 18 inch stem . Fruity fragrance. CommentsMix peat moss, compost, or well-rotted manure into the soil. Mound the soil in the center of the hole, spread roots over mound; add half the soil and compact it down; complete the filling, compact soil and water well. Feed monthly with rose food until late Summer. Water once weekly when rainfall is scarce. Remove spent blossoms, weak growth and suckers. Spray or dust bi-weekly for insects and disease. 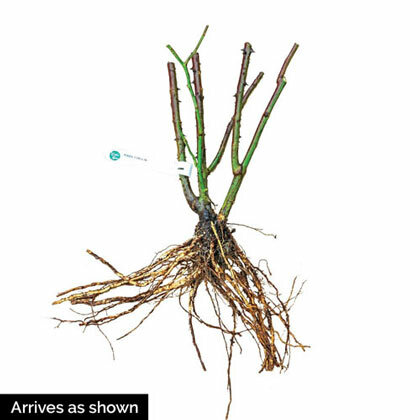 Mulch heavily around the base and cover rest of plant with straw or shredded leaves. Hold in place with burlap or chicken wire. Size5 1/2 inch blossoms. 35 - 45 petals. DepthSoak the bareroot in water for about an hour. As a rule of thumb, dig the hole about 1 1/2 times as deep and 1 1/2 times as wide as the root system is long. Mound a small pile of soil in the center of the hole as a support for the rose's root crown.